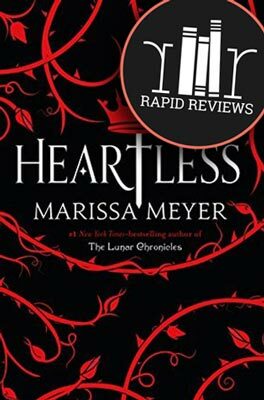 No spoilers in this rapid review of Heartless by Marissa Meyer. I give it 4.5 stars. I LOVED this book! I really enjoyed The Lunar Chronicles, especially the Fairest novella, but Heartless is my favorite Meyer novel to date. The skill with which she mingles fairy tales and her own original material is amazing. She really is perfecting her craft! The main source material Meyer pulls on for Heartless is Alice in Wonderland, focusing on the Queen of Hearts’ formative story. Her main character, Catherine Pinkerton (Cath), has unconventional plans for her life. Cath’s parents are nobility and have high hopes she can advance further up the social ladder because she has caught the eye of the king. Mr. and Mrs. Pinkerton hope a proposal is imminent, yet Cath could care less about the bumbling ruler’s affection. Cath loves to bake and hopes to open a bakery with her lady’s maid (and secret math and business whiz) Mary Ann. She has no interest in men or courting or marriage. No interest, that is, until she meets Jest, the king’s new court joker. Jest wows the crowd and catches Cath’s eye in particular. A spark quickly develops between the two of them. Cath can’t get Jest out of her mind and can’t keep the king out of her hair. These relationships continue to develop against the backdrop of the kingdom of Hearts, including all the Wonderland characters we know and love as well as a few characters from other literary works. Meyer is so imaginative with how she incorporates each and every character in her story. She drops hints about what might happen from the very beginning of the book, and I tried to keep track of all of them and predict how it would all wrap up. I correctly guessed what some of the hints meant and was totally wrong about others. And every time I thought ‘Okay, this is when so-and-so is going to show their true colors’ or ‘This must be how Meyer is going to resolve everything,’ I was sorely mistaken. The whimsical tone and lighthearted feel throughout much of Heartless is perfect for a fairy tale retelling. I hung on every word from start to finish. Yet (and I apologize in advance about this terrible pun) I guess I’m not heartless because Meyer really tugged on my heartstrings at times. I don’t know when I’ve had a bigger lump lodged in my throat than when I read certain sections of this book. I definitely recommend it to everyone who loves to read YA and/or a good retelling! It probably won’t top The Lunar Chronicles for all Meyer fans, but it easily did for me. I thought it was nearly perfect from start to finish, and Heartless now has a space on my favorites list. Let us know what you think about Heartless in the comments! No spoilers on this page please! Ready to read Heartless? Click to buy and help us pay for hosting. Oh and share this review of Heartless with your friends who might like this book!